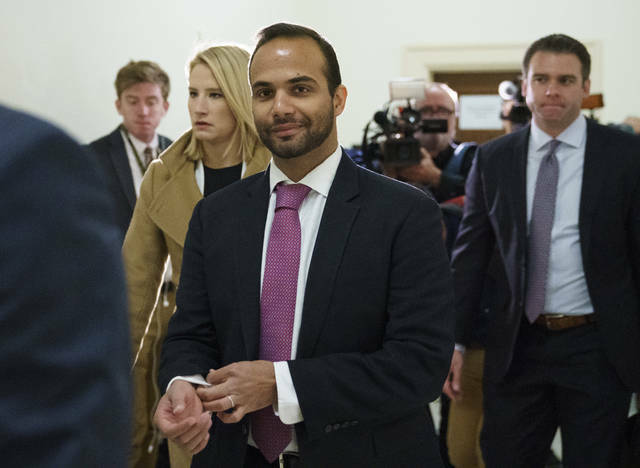 But in a 13-page opinion Sunday, U.S. District Court Judge Randolph Moss said Papadopoulos had waited too long to contest his sentence. Moss noted that Papadopoulos had agreed not to appeal in most circumstances as part of his plea agreement, and the judge said the challenge to Mueller’s appointment was unlikely to be successful in the U.S. Court of Appeals for the District of Columbia Circuit. Papadopoulos’ wife, Simona Mangiante, tweeted last week that Papadopoulos had been assigned to a prison in Wisconsin. The only facility in the state is a medium-security prison, with an adjacent minimum-security camp, in the village of Oxford, about an hour’s drive north of Madison. Responding to the judge’s order, Papadopoulos wrote in a tweet on Sunday that he looked forward to telling the full story behind his case. Holly Kuzmich is executive director of the George W. Bush Institute and senior vice president of the George W. Bush Presidential Center. She originally wrote this essay for “The Catalyst: A Journal of Ideas from the Bush Institute.” This is distributed by InsideSources.com. Take, for instance, the huge U.S. air and Marine bases on Okinawa. People over there, living in Japan’s southernmost island prefecture, historically the independent Ryukyu kingdom, cannot see why the United States, fully supported by the government of Prime Minister Shinzo Abe in Tokyo, does not scale down the American presence. The answer in part is they’re the cutting edge of U.S. power in the Pacific. More than 50,000 U.S. troops are based in Japan, nearly twice as many as the 28,500 in South Korea, and U.S. and Japanese strategic planners see their presence as critical as long as North Korea remains a threat, refusing to give up its nukes and missiles, and China looms as a dominant regional power from the Indian Ocean to the South China Sea to the Yellow Sea. A majority of the people of Okinawa clearly disagree. Okinawa’s newly elected governor, Yasuhiro “Denny” Tamaki, is in Washington explaining why he easily defeated a candidate supported by the central government in the recent election. The differences centered on the determination of the government to build a U.S. Marine air station off the northeastern coast near a major U.S. Marine base, Camp Schwab, and the equal determination of clearly a majority of the people of Okinawa to stop construction. Tamaki’s view is the Americans should build the air station elsewhere in Japan — anywhere but Okinawa. He does not really oppose the presence of Kadena Air Base, one of the largest U.S. Air Force bases anywhere, and he is not calling for the Marines to go home. Maybe, he said, they could relocate elsewhere on Okinawa, somewhere near Kadena. It’s not likely, however, that Japanese would welcome expansion of U.S. forces on the main Japanese islands. The U.S. Navy base at Yokosuka and the air base at Yokota, both fairly near Tokyo, are vital, but Japanese oppose having more U.S. bases on their soil. For old people on Okinawa, the worst nightmare is the battle for Okinawa in the spring of 1945 when more than 200,000 died, more than half of them local citizens. U.S. forces won the battle at a cost of 12,520 American lives. The Okinawan people suffered far more. All told, 94,000 civilians were killed ― plus 22,228 soldiers from Okinawa drafted into in the Japanese army. An additional 65,908 troops from “mainland” Japan died in the battle, the worst in the Pacific War.